Too little is being done to help an estimated 60,000 children in Britain with gambling problems, a leading mental health expert is warning. The director of the NHS's first treatment clinic for people with gambling problems says there should be a similar centre for children. Dr Henrietta Bowden-Jones also said she would like a ban on all child gambling. 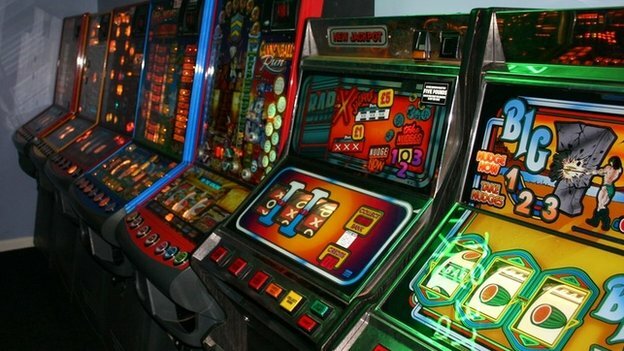 Currently children aged under 16 can legally play some lower stake and jackpot fruit machines. They are allowed to play category-D machines, which allow a maximum stake of £1 and have various restrictions on prizes - including no money prizes greater than £10. Britain is the only Western democracy that continues to allow children to play limited-stake fruit machines. But the National Problem Gambling Clinic in London, which opened in 2008 and treats about 800 cases a year, only helps those over 16. Dr Bowden-Jones says: "Although it is between 2% to 4% of the population of young people who have problems, we also know that far, far higher numbers are deemed to be at risk of becoming pathological gamblers or are gambling in excess." Adrian Hudson was eight when he discovered gambling, visiting amusement arcades with his father on seaside holidays. "It all started for me with fruit machines. The lights were flashing and there was money coming out of the bottom. All of a sudden you'd be filling your pockets and thinking, 'What am I going to do with this money? I know what I'm going to do, I'm going to try and get more.' And that was basically it, hooked," he says. This childhood fun turned into a secret and frightening adult addiction. "Looking back, I don't know whether it was shame or guilt I never talked to anybody. I'm 42 this birthday and I don't have any friends. My gambling has cost me my marriage and the day-to-day existence with my family and my children." The gambling industry prides itself on making a big effort to keep children out of betting shops. But, according to Gambling Commission figures, between April 2012 and March 2013 betting shop staff reported more than 600,000 occasions where young people suspected of being under age had been stopped either trying to get into shops or after they had placed a bet. Richard, which is not his real name, 19, from south London, remembers getting in to a bookies as a child. It was, he says, the start of a ruinous relationship with roulette machines. "When you're putting down your money on the numbers and the ball is spinning, you get butterflies in your stomach. Then you start playing with more and more money. Like doing £100 spins, and if it doesn't come [up] you do it again, and again, and again." Richard, who is now being treated at the NHS clinic, progressed to 24-hour sessions in bookies and casinos. At one point he lost £10,000 in just four days. Now he wants the law changed to help stop other youngsters sharing his fate. Gamblers Anonymous UK - "a fellowship of men and women who have joined together to do something about their own gambling problem"
"You should only be able to gamble when you're 25, when you really know what you're doing. And I think they should shut down most of the bookie shops because they're opening everywhere, on every single High Street. As soon as you see one you just want to go in there," he said. Jake Berry, Conservative MP for Rossendale and Darwen, believes the growth of TV gambling ads, especially those offering online betting, should be banned before 21:00. "Gambling adverts used to be about one in 300 on television and it's now predicted this year to become one in 20 adverts. And I think it does show that people are being conditioned into gambling at a young age," he says. Mr Berry says research funded by the gambling industry suggests people cannot fully evaluate risk until they are about 25 years old. He believes advertisers should be given the chance to draw up their own new voluntary code. "But, make no mistake, if they fail to act it is my view that the government should act," he adds. Marc Etches, of the industry-funded charity Responsible Gambling Trust, shares concerns about the prevalence of children with gambling problems and the fact many adults suffering from these started when they were young. But, he says, there is no clear evidence that a rise in gambling adverts is making things worse. Dr Bowden-Jones was asked what was happening to the youngsters with gambling problems, given there is no specialist clinic for children in the UK. Her reply, after a long deep intake of breath, was chilling. "I have no idea," she says.